More than two hundred dazzling and finely crafted objects of metal, stone, wood, and other prized materials characterize the art of Treasures from the Royal Tombs of Ur, a traveling exhibition that explored one of the greatest technological achievements of Near Eastern archaeology. Between 1922 and 1934, a team of archaeologists headed by Sir Leonard Woolley (1880–1960) excavated the site of Ur, located on the west bank of the Euphrates River in what is now southern Iraq. Traditionally considered the birthplace of Abraham, Ur offered a promising site for exploring the region's earliest history. The expedition's most spectacular discovery was a group of burials known as the Royal Tombs. Dating to the mid-third millennium B.C., these graves contained goods of unparalleled beauty and craftsmanship and rank among the highest masterpieces of Sumerian art. Woolley discovered the intact tomb of a royal woman named Puabi, along with hundreds of additional burials. This exhibition featured the extraordinary artifacts found in the Royal Tombs. Exquisite gold jewelry, stone and metal vessels, and weapons—some decorated with floral and animal motifs and precious gems—were on view, along with the most impressive remains of musical instruments recovered from ancient Mesopotamia. A reconstructed monumental wooden lyre was also exhibited. 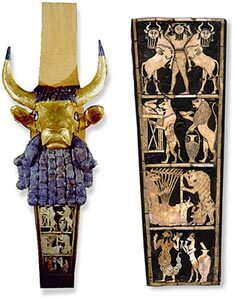 Particularly noteworthy was the world-renowned Ram Caught in a Thicket, a statuette of lapis lazuli, gold, and shell depicting a standing animal nibbling the leaves of a tree or bush. This exhibition has been organized by the University of Pennsylvania Museum of Archaeology and Anthropology and is sponsored by The Pew Charitable Trusts. At the Library, Treasures from the Royal Tombs of Ur is made possible by Jeannette and Jonathan Rosen and Mrs. Roswell Gilpatric. Generous support provided by The Judy and Michael Steinhardt Foundation, Dr. Vallo and Julia Benjamin, and the Malcolm Hewitt Wiener Foundation. Additional assistance from Laurie and David Ying, Diana and Frederick Elghanayan, and the Rodney L. White Foundation. Hank Walter contributed special media support.